The total computer usage by senior citizens is 60 percent and 27 percent for each respective age group. The elderly population demonstrated the highest percentage increase in computer usage over the past 3 years. Some may believe that the elderly will not be so adamant to adopt to change. However, in Singapore, the case is the opposite, the Infocomm Development Authority most recent study reveals. 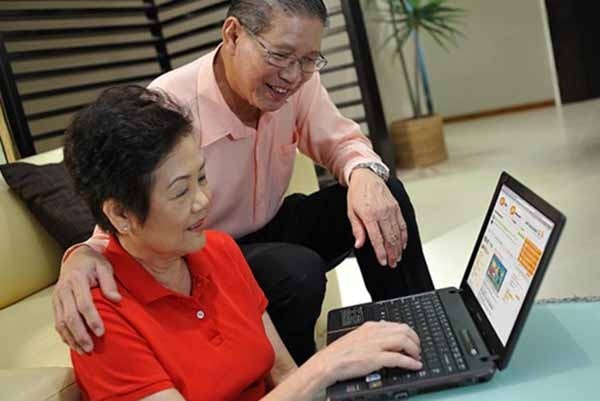 Based on IDA’s Annual Survey on Infocomm Usage in Households 2014, there has recently been a substantial increase in computer usage by senior citizens. Computer usage rates increased by 14 and 11 percent for age groups 50-59 and 60 & above, respectively. It was found that in 2014, the total computer usage by senior citizens is 60 percent and 27 percent for each respective age group. The elderly population demonstrated the highest percentage increase in computer usage over the past 3 years. It was also found that in 2014, over three-quarter and one-third of senior citizens ages 50-59 and 60 & above had used smartphones to access the Internet in the past 3 months. This demonstrated an exponential increase from 2012 of 30 and 19 percent for each age group, respectively. Several technology solutions and mobile apps are being offered, providing support the elderly population. We recently reported on the new app, AICare Link, which aims to help senior caregivers check to see the eligibility for a range of government subsidies. While catching up with Dr. Tan Hwee Pink of SMU, we learned about the Shine Seniors program which places IoT sensors in homes to enable the ageing in place. However, this study shows that not only is the ageing population being abetted by these solutions… technology is being readily embraced by them! “We are encouraged to see residents becoming more tech-savvy and connected, particularly the silver generation. This is useful to help the industry explore new opportunities to serve our citizens better and help build Singapore into a Smart Nation,” stated Mr Steve Leonard, Executive Deputy Chairman, IDA. Internet and Broadband access rates were 98 percent and 97 percent in 2014, for households with school-going children. Residents preferred accessing the Internet wirelessly via mobile network as opposed to connecting through public WiFi hotspots. About 70 percent of online shoppers spent at least $100 on online purchases. More than 8 in 10 residents have installed Internet security measures such as anti-virus software and security updates on home computers. Yet, the rate for anti-virus software adoption on mobile phones sits at 30 percent, showing a decrease in 2014. To read the complete 2014 Annual Survey on Infomm Usage in Households, visit the IDA website.